The Axis and Allies: War at Sea rules from the second edition starter set. 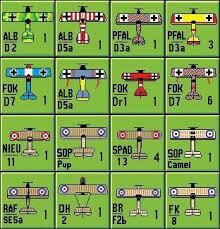 I am using a variant of these for my North Atlantic project. Work on the 1:4800th scale WW2 ships continues apace and the other parts of the project are gradually falling into place. I shall be using a variant of the rules from Axis and Allies: War at Sea as these have several practical advantages in the short term. To begin with I have the map sheets that came with the starter set laminated and ready to use. 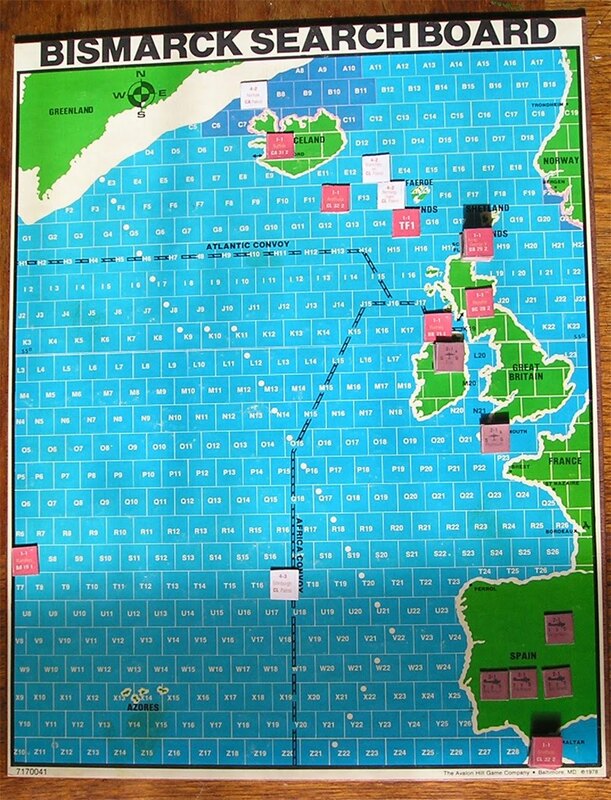 They have an offset square grid which coincides with the search boards of the North Atlantic contained in the Avalon Hill game Bismarck. As an aside I once ran a mini campaign on a similar theme with a self-drawn map based loosely on the Bismarck search boards – the scale was much larger but it worked Ok for a club night game. 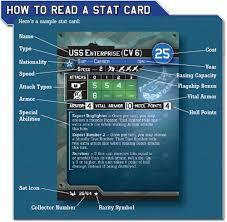 A ship stat card from the game. The variant rules I am using do not use the special abilities. I was never a fan of special abilities as it meant that a one off event that occurred historically was replicated every time that particular ship was used. It also made a virtue of abilities that were not limited to a particular ship or even navy. Whilst I no longer have the ship cards for the original Axis and Allies: War at Sea game I do have all of the stats in tabular form so will be able to fight any number of actions readily enough. At this stage all I need to do is to prepare some national fleet lists which will be easy enough to do. The paper playing mat that comes with the starter set being used for a game. The mat is two sided with the reverse being a plain seascape. Note the island tiles in use above. My own version has been laminated as the paper wears out along the folds very quickly. The squares are 3 1/2" across. The rule mechanics are very straightforward. Essentially ships have a number of hits based primarily on their tonnage and have two armour ratings that are used to assess any damage. Ships typically have between 2 and 6 hull hits. There is a normal armour rating which represents the number of hits or ‘successes’ as they are known that need to be scored by the attacking player in order to score a single point of hull damage. The second armour rating is described as ‘vital armour’ and should an attacking player score successes that equal or better this rating then the target is destroyed. Each d6 the firing player rolls score 1 success for a roll of 4 or 5 and 2 for a 6. Anything else is a miss. This mechanic is also used for all other types of combat. Ships roll a number of d6 depending on the calibre and number of guns or other weapons being used which reduces with range. As a result of hull hits a ship may lose some of its special abilities but when it is down to a single remaining point it is classed as crippled which impacts just about everything. Ships generally have a maximum speed of anything from 1 to 4 with certain ships requiring a successful dice roll to use a higher speed. This is typically for things like modernised WW1 era battleships. It is quite s ‘gamey’ system – rolling great fistfuls of d6s is always enjoyable - but is good fun to play. As I have everything I need to use these rules it would churlish of me not to. The variant I am using makes the rules a little more ‘naval wargame-ish’ in that, for example, ship facing is taken into consideration as well turning ability. Although they have been written with hexes in mind there is no reason why I should not persevere with offset squares as the relationship between hexes and offset squares is mercifully quite close. I had a busy weekend with various things but have managed to put a shift in with the 1:4800th WW2 ships and other parts of my North Atlantic project. The ships are all based and undercoated (not the destroyers as yet as these will follow once the larger stuff has been completed) so the real work can now commence. My new painting station - by the patio doors in the lounge - is an ideal location for daylight so I am actually enjoying the process for a change (my aversion to painting being well known). Setting up the area is quick and easy as the table folds away in seconds and everything I need is in the sideboard about 3ft away. I have settled on another shade of blue for the ship bases as my previous and long serving Humbrol Matt 25 is a little on the dark side for these diminutive models. Whilst we were out on Sunday for some shopping I had a quick look around in Hobbycraft and found a good medium blue/grey enamel - Matt 89 Middle Blue as I recall - that is a pretty close match for the main shade of the Axis and Allies: War at Sea maps. Now I know this is a little on the sky blue side but the plan is to wash this with blue/green ink before adding the waves and wakes. The ship name label and national ensign will also help to reduce the 'blueness'. I am not a fan of mixing colours and I must confess to preferring my sea to look blue rather than grey or green. I dug out the aforementioned maps to reacquaint myself with them and will be fine for what I am planning and best of all the squares are 3 1/2” across the flats. This means that the largest ship base of 7cm will fit in with no overhang. I was also able to locate the printed copy of Axis and Allies: War at Sea using miniatures with all the ship and aircraft stats in tabular form. I no longer have the ships or cards that came with the original game but this little lot will more than do the job - all I need to do is draw up some fleet lists with the stats. The rules and the stats are now safely in a folder for me to read whilst on my daily commute. Something I did with the models over the weekend that I am rather pleased with is convert a Royal Navy County Class cruiser into one of the quite different looking sub classes. I needed a model of HMS London but MY Miniatures do not make one. I read somewhere that she was refitted using a similar superstructure layout to a Colony class cruiser so as I had one of these spare, plus a slightly miscast County class I was able marry the two together to give a reason approximation of the type. 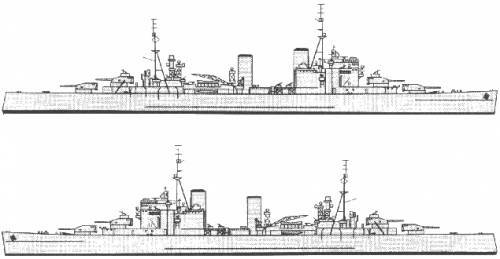 the main differences were that the London had a much lighter rear superstructure and only two funnels - the forward of which was partially encased in the forward superstructure. It was quite straightforward to do albeit a little time-consuming and fiddly. The worst part was filing odd pieces of superstructure to size but I got there in the end. Whilst it will not win any prizes for super-detailing the end result will definitely pass muster. The model is currently undercoated with its near sisters awaiting its topcoat. Once I have this lot finished I will of course being posting to the blog with pictures of everything. I really feel like I achieved something this weekend as aside from the above I was also able to sort out the 15mm WW1 Turks and Arabs. There are a couple of items I need to add to complete this but nothing too involved. For the Arabs I need some Rolls Royce Armoured Cars, some machine guns and some French artillery. I will also need to change the command groups slightly but nothing major. The Turks are good to go as they are. All in all then, a very positive start. 1:4800th scale WW2 Japanese produced by Shapeways. These are superbly detailed models (note the aircraft on the flight deck of the carrier) but are not cheap. then again, compared to MY Miniatures very little is! It has been a busy few weeks since my birthday at the end of last month (28/09). We seem to have had a lot of things going at home and so my dedicated home based hobby time has been a little restricted. I say home based as this is where the painting and gaming take place - my commute to and from work is spent reading and researching so I am still making progress albeit in a different direction. This weekend sees what passes for normality in our house in that SWMBO will be at work tomorrow afternoon (she works alternate Fridays and Saturdays) as will my son. He is currently working 6 days a week - he is a self-employed electrician - and doing rather well. Finally my daughter is back at university (in Reading) so it means that for five glorious hours I will have the house to myself. I have a couple of things to take care of on the domestic front but for the most part I will finally be able to get down to some painting. I came across the above picture of some painted Leicester Micro Models 1:4800th scale warships (now produced by MY Miniatures) and a copy of the catalogue from the late 1970s. Compared to Shapeways and C in C these are very basic by comparison but manage to capture the profile of the ships represented rather nicely. Crucially they are also very modestly priced compared to the others at 40p per item for all but the largest vessels. I have the last of the models from MY Miniatures for the 1:4800th scale WW2 North Atlantic project - if you recall this is based on the Avalon Hill board game Bismarck - so will be basing and undercoating them. I will also need to make sure that I have the appropriate name labels so I will need to spend some time on the Mac as well. I know I have most of these but it will be easy enough to print out a fresh sheet. I also have sufficient ensigns as well although I will probably need to get some more Royal Navy types for when I venture into the Mediterranean. I am feeling pretty positive about my projects at the moment as for the most immediate ones I have everything I need to tackle them. 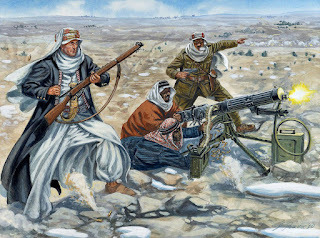 I have all the figures I need for the WW1 Arab Revolt in 15mm for the Portable Wargame, I have all the Spencer Smith 30mm ACWs for the Kurz and Allison project as well as everything for OGRE. When I say everything I should qualify that by saying I have everything I need for the first phase which would be more than enough for gaming purposes. The Arab Revolt will need some armoured cars and possibly some French mountain artillery. Some tropical service uniformed British specialists would be useful - I am thinking machine guns and similar - so I will keep an eye out for some. Apart from the armoured cars none of this is really urgent and indeed, even the cars are not really compulsory. 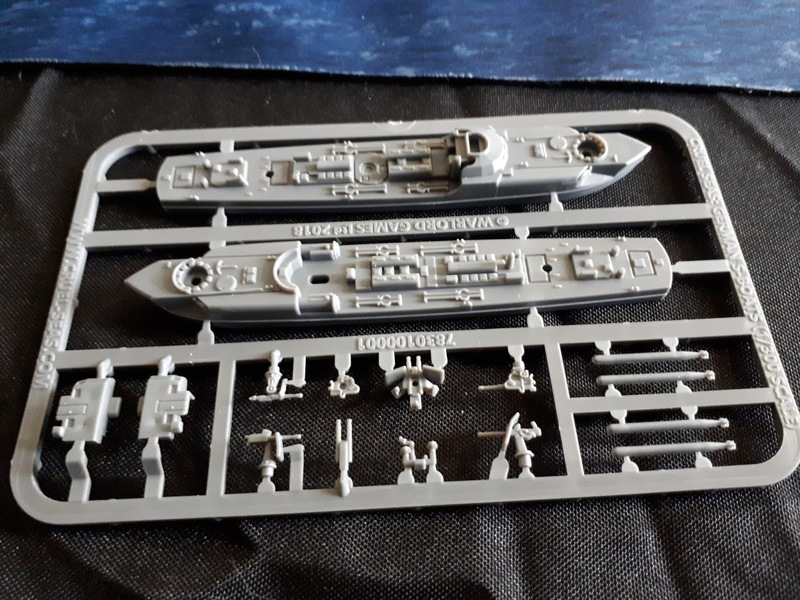 For the Kurz and Allison collection the only other thing I need would be some ships but again, these are not essential in the short term and as they are being scratch built will form a side project in any event. “From Little Acorns Do Mighty Oaks Grow” or so the saying goes. In this particular case it is very apt as it concerns the usual fate that befalls me when I fall victim to a single source of inspiration. In this particular instance it all started when SWMBO and I finally settled on our holiday location for next year. For a variety of reasons, too numerous to go into, we have booked two weeks in Cuba in June on an all-inclusive, adult only basis. 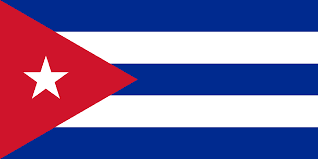 Cuba will be a first for us in that we have never flown long haul before as our usual holiday destinations tend to be in the Mediterranean with the occasional foray into the Atlantic to the Canary Island or even more daringly, Cape Verde. To be quite blunt about it the cost of going to Cuba for two weeks on an all-inclusive, adult only, 5 star basis was only a couple of hundred pounds dearer than going to the European part of the Mediterranean on a similar package. You can get some good deals but sadly in my experience the all-inclusive European option nowadays tends to be on the basis of the absolute bare minimum they can get away with so diluted drinks, limited choices of food and charges for whatever they can seem to be the order of the day. All inclusive for us is a huge convenience and whilst I must confess to missing the flexibility that a self-catering/bed and breakfast/half or full board basis can offer, the pros usually outweigh the cons. We will be flying onto Holguin on the way to our resort which is roughly an hour from the airport (located on the coast where it says Holguin on the map, facing the Atlantic Ocean). We will be based towards the Eastern end of the island and the airport we will be travelling to is at Holguin. We are staying on the Atlantic coast of the island and the plan is to tackle a few trips whilst we are there – Havana being an obvious choice – instead of lazing on the beach with a Kindle in one hand and a Cubre Libre in the other. As part of my inevitable reading around the history of the island (and largely ignoring anything Castro/Bay of Pigs/Missile Crisis related) I have found myself looking at the Spanish American War of 1898 and the fighting in and around Cuba. I have never considered the war of 1898 as a gaming choice and at this stage I am certainly not planning to do so but that would not stop me from reading about the conflict. 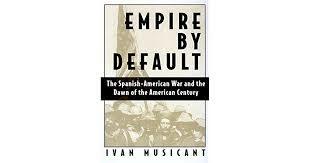 The war was quite low level in terms of numbers but the outcome certainly established the US as a world power. At a more personal level I note that Kurz and Allison – of ACW fame - produced a series of prints on the war (8 in all as I recall) which look suitably heroic and inspiring in an old toy soldier kind of way. Picked up for a song and highly regarded. I picked up the above book (which is a hefty 740 page doorstop of a volume) from Ebay for a mere £4. I have read Ivan Musicant’s book Divided Waters which is a great history of the American Civil War afloat and so when I found out, via a Facebook group I belong to, that he had written a title about the war my curiosity was piqued. I am after a couple of other titles – purely for completeness sake of course – on the war and who knows? One day I may game elements of it. The Osprey Campaign Title on San Juan Hill by the indefatigable Angus Konstam is supposed to be pretty good as well so I may well look that out and the new Men at Arms title which also covers the US in the Philippines. The ships for the naval side are available from Tumbling Dice and Navwar (amongst others) and the land actions lend themselves to both the Portable Wargame and The Men Who Would be Kings. Figures are available from Old Glory amongst others and if I remember correctly there are a couple of Volley and Bayonet supplements covering the war. Is this another project for DC to tackle at some point? To be honest I am not sure without having read about the war in more detail. Certainly the scale lends itself well to the style and size of action I prefer fighting but for now I have more than enough to be getting on with. A rather dramatic scene from somewhere in the desert - not sure what the Vickers gunner is shooting at though! 1 x Staff car with 2 foot officers in attendance. I will also be adding to this three Rolls Royce Armoured Cars, possibly some machine guns assuming I can source suitable figures and some French mountain artillery, again when I have some more details. The above collection is designed very much with the Portable Wargame in mind and so it can be seen that one can raise some very representative forces that are quite modest in size (and cost). Taking the collection forward I have in mind some Russian opposition for the Caucasus Front as well as the French Foreign Legion in due course. Both of these forces will be of a similar size to the above. On a different tack the last of the 1:4800th scale WW2 ships for the North Atlantic have arrived which means that work can begin in earnest on this project. The plan is to have all the models finished for this completed by the end of the year so that work can then commence on the Kurz and Allison Spencer Smith ACW project which will also include some scratch built ships for good measure. You may recall at the end of last year the UK lost one of its unsung wargaming pioneers in the shape of Eric Knowles. There were many blog posts about Eric by both Bob Cordery and I who had the honour and privilege of wargaming with him during the legendary Madasahatta campaign at the end of the 1970s and into the early 1980s. At the time of writing I am helping, when I can, Eric’s son Bill to organise his father’s extensive collection prior to disposal. Eric’s collection was huge. When I say huge I mean as in filling up a double garage, a loft, a downstairs reception room and a horsebox huge. Bill was tasked with the Herculean labour of sorting out the whole and arranging for its disposal. I offered to assist him with this and trust me, it is a gargantuan undertaking. The main bulk of the collection is painted 25mm 18th century armies and an awful lot of WW2 in 20mm. 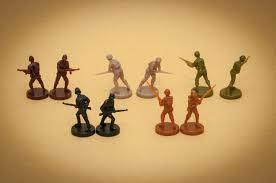 There is also a prodigious quantity of unpainted metal organised into armies that Eric had not gotten around to. Bill has made some inroads into the collection and has sorted out some dozen or so plastic storage boxes full of the unpainted metal – at least that which he has found so far. At this stage I have no idea about what the unpainted 18th century figures consist of only that is covers the 1680 to 1740 period and is divided up into complete armies. That is complete armies – cavalry, infantry, artillery, the whole nine yards. Unpainted. The collection also includes an extensive library and a lot of 1:1200th scale ships – both plastic and metal. In many ways the unpainted material is the easiest part of the collection to sort out as for the most part the figures can be bagged and stored quite unceremoniously in bags and boxes. The painted part will be rather more challenging as care will be needed in storing the figures. Eric has units in boxes with labels but time has not been kind on the boxes and so a new storage system will be needed. The average size for each army is around a dozen or so infantry regiments usually of anything from 24 to 36 figures, half a dozen or so cavalry units of up to 20 figures and artillery like you would not believe. Eric was fond of artillery as well as the whole siege and baggage train thing, not to mention command and staff and sundry non-combatant hangers on so there is plenty of peripheral material. One of the largest armies in his collection was his Ottoman Turkish force. This is enormous and also has rather a lot of unpainted metal to go with it. Eric really went to town with this army and the end result was simply outrageous in respect of its size. As I recall much of it was 25mm Minifigs but lord alone knows what else is in it and waiting for Bill to unearth. I remember facing this army in its full glory when we refought the siege of Vienna 1683. When is was deployed on the table it took the combined efforts of several collections to field the required scale of opposition. I say unearth intentionally as Bill does not have a clue what is where until he actually opens the boxes. Any order these may have been in disappeared when Eric’s bungalow was cleared and the contents stacked, box upon box, in Bill’s horsebox for the first of a number of trips to various destinations. By degrees the remaining parts of Eric’s collection is converging on Bill’s house which is fortunately large enough to store it. I have this image of him in full on Indiana Jones mode brushing off the dust of ages by the light of a guttering torch…. Anyway, to the point of the post. Bill is of the opinion that Eric’s collection as far as possible should go to those that would appreciate it for what it is. There is a tangible value to much of it but money is not the sole motivator for his decision and he is to be applauded for this. The 18th century painted collection alone is probably quite valuable and when you factor in the books and ships etc there is some significant financial return to be made in due course. We were discussing this very point when Bill casually slipped into the conversation that the Ottoman Turks and the Madasahatta stuff he was giving to me. That’s right, Eric’s Ottoman Turkish army and all of the Madasahatta kit is coming to me. Gobsmacked, awe-struck and most certainly moved. Eric and Ivy, his wife, were an important part of my life when I first moved away from home to London as a mere boy of 17 and as Eric was responsible for my lifelong interest in the Sublime Porte (not to mention WW1 Colonial-style campaigns) this bequest is a marvellous way to remember them. Bill pointed out that as yet both collections needed to be found and reorganised – the only part I saw when I visited him was the Sultan’s camp complete with scimitar wielding eunuchs and a harem for the Turks as well as British artillery from the Madasahatta set up, together with some unpainted African tribesman. The condition of both collections is yet to be ascertained but suspect that some running repairs will inevitably be needed. This is of little import in the overall scheme of things though. Being the steward of two such significant collections is a singular honour and I am truly at a loss for words at this incredible gesture. I hope that my gaming efforts using these armies in due course will be worthy of the memory of both Eric and Ivy. A box full of Sci_fi goodies if you like the idea of huge AI controlled tanks wreaking havoc - which I do! By way of a complete change from everything historical I was delighted to finally get my hands on a copy of the OGRE Battle Box by Steve Jackson Games. You may recall from from earlier posts I had recently acquired a couple of copies of the first miniatures set and was waiting for the second set to be released. Thus far the second set is only available as part of the Battle Box which includes copies of both set one and two. Ordinarily then, this would mean that I would have three copies and set one and one of set two by the addition of the Battle Box. I have avoided this for the time being as shipping from the US would have been rather expensive. However, by chance I was contacted by one of the UK based kickstarter sponsors vis the OGRE/GEV Facebook group that was able to supply not only the Battle Box but also and extra set two that was spare from the giant deluxe edition. This now means I have three copies of set one and two of set two - in other words plenty of 1:285th plastic Sci-fi kit to play around with. The map that comes on the Battle Box is quite large - 28.5” by 33” and is based on the original GEV map. My plan will be to replicate this using Heroscape tiles. Taking into account the extras I have (twice the above and then some) there is plenty to play around with, not only in the OGRE universe but for Sci-Fi games in general. I am happily reaching a kind of tipping point with my projects - I say happily because I have 97 percent of what I need to complete them. I have the figures for both armies for the Kurz and Allison ACW project, the figures for the WW1 Arab Revolt are on their way, the last of the North Atlantic ships have been identified and ordered and I have all that I need for OGRE. The running order for the project list is the WW2 ships first and then the Spencer Smiths will feature (with some scratch built ships). I then plan to tackle the Arab Revolt but I fully expect to be painting MTBs and S Boats when Warlord Games release Cruel Seas. My order from Spencer Smith Miniatures has arrived. The figures in this batch are all that I need to complete the ACW project based on the Kurz and Allison prints. For the most part the order is what would be called Confederate so pretty much everything is wearing a hat rather than a kepi. This part of the order is in fact now intended as a Christmas present so the package will be handed over to SWMBO to reappear, suitably attired in its festive apparel, on December 25th amidst the inevitable"Ooh, I wonder what this could be?" type comments. If I am honest it has done me a favour as I want to tackle the whole thing in one fell swoop when I get to it. A little on the 'flashy' side but easy enough to clean up. Previously I mentioned that Spencer Smith produce a range of 30mm Zulu war figures and I was very intrigued by this as I could not recall ever seeing these when Spencer Smith were in their heyday so to speak. From the pictures on the Spencer Smith website they looked a completely different style to the familiar ACW and 18th century ranges. I asked Peter Johnstone, the proprietor of Spencer Smith, about them and it appears the range came about as the result of a private commission. At this time I do not have any further details other than the chap that ordered them came from Wales and went by the name of Jones. Anyway, here are three from the range. The Zulu looks suitably menacing and is not a bad casting at all, albeit very retro looking. the Zulu part of the range is quite modest in terms of choice so armies will be quite uniform in terms of pose. I have no problem with this but these days individual animation seems to be de rigueur so they may well offend the purist. I rather like the NCO type in the background. Note the separate shield for the Zulu. The British infantry look fine although the range seems to be full of dramatically lunging, thrusting, readying and parrying types - presumably defending something behind a pile of mealie bags or similar. Thankfully there are some more traditional marching and advancing types. It seems a little odd that there is greater variety of poses in the British list than there is for the Zulus - you have expected it to be the other way around. I am not a fan of kneeling figures and in this case the example above seems nearly as tall as his standing compatriot. For me that is not an issue as I would not use them in any event. These are not the best figures you will ever get for the Zulu War and the range is just about sufficient to raise a couple of forces. One could add to the British certain figures from the ACW Confederate types - these would make perfectly usable Boers so the First Boer War would be a feasible alternative or even Boers versus the Zulus because after all, "They are the enemy of my blood" as Ardendorff mentioned in the film Zulu. As these are true 30mm they are smaller than most other types currently available as 28mm but I am thinking that they may fit with something like Warrior or similar if needs be. The biggest attraction with these figures, aside from the old school vibe they have, is that the foot figures are 60p a go. All in all a pretty good range and certainly one I would be happy to use. From David Lean's epic masterpiece Lawrence of Arabia. As anyone that knows me will confirm, my capacity for U turns is legendary. I always set out with the best of intentions but as sure as eggs are eggs something will come along to derail whatever it is that is the current flavour of the month. In my defence it is safe to say that invariably what tends to happen is that the derailed project eventually resurfaces for a while and then recedes politely back into the subconscious, only to reappear yet again at a later date. This has been a familiar and depressing pattern for me for many years now! In truth though, I have only really abandoned a few ideas so what is left is a rather large bucket list of potential projects that fade in and out of vogue with monotonous regularity. So it is with the Arab Revolt. I have invested a lot of time, effort and interest in the Arab Revolt for many, many years now but for a variety of reasons it has never really taken off from a gaming perspective. Like an old friend, David Lean’s epic film Lawrence of Arabia always inspires me and reading The Seven Pillars of Wisdom for the umpteenth time is guaranteed to get my creative juices going, that and an irrational liking for Rolls Royce armoured cars. I have my own thoughts on what the Arab Revolt should look like on the table top and am comfortable that if all the pieces were in place I could make a really good fist of it. For a variety of reasons though, all the pieces have never seemed to be in the same space and time and so I have yet to bridge the gap between project and reality but you know what? I have a funny feeling this may be about to change! 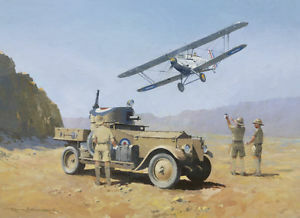 A Rolls Royce armoured car with RAF markings being 'buzzed' by a Hawker Hart. Whilst not set during the Great War it is still a very evocative picture. You know what it is like. You look long and hard at something and start looking at what is available and from whom. In my experience many projects fall flat on their face at this point as it seems to be an unwritten rule that at least one part of what is needed is usually unavailable. I may be a overly picky in this respect but I tend to prefer sourcing figures from a single manufacturer rather than ‘mixing and matching’. It has held me back for sure but it is something I prefer to keep to if I can. Irregular Miniatures now produce a range of 15mm WW1 Turks. There, I said it. They also produce some rather nice ranges of Arabs types including cavalry, camelry, infantry, civilians and much else besides. They do not (at present) produce a Rolls Royce armoured car; nor do they have any WW1 British infantry in their tropical uniform. However, and I suppose I am mellowing with age, what is available would be more than enough to be able to raise a couple of Portable Wargame style armies. So what does this all mean? Well, something will have to give if I am to raise these forces and so, after much thought, I have decided that the French Foreign Legion will need to stand down. As much as I really enjoy the adventures of La Legion the Arab Revolt will always top it in my interests. The biggest single advantage though, is that I can make use of the Turks to fight the Russians and the British (Greeks as well if needs be) and the Arabs to fight pretty much anybody. It also gives me an excuse to make some ships for the Red Sea as well as adding a few of the aforementioned Rolls Royce armoured cars. On a totally different subject does anybody have any information about the Russian army of around 1710? There is something in the offing that has prompted the question so all will be revealed in due course. Suffice it to say that my hankering for something 18th century-ish may well be realised in a way I could not have possibly imagined…. 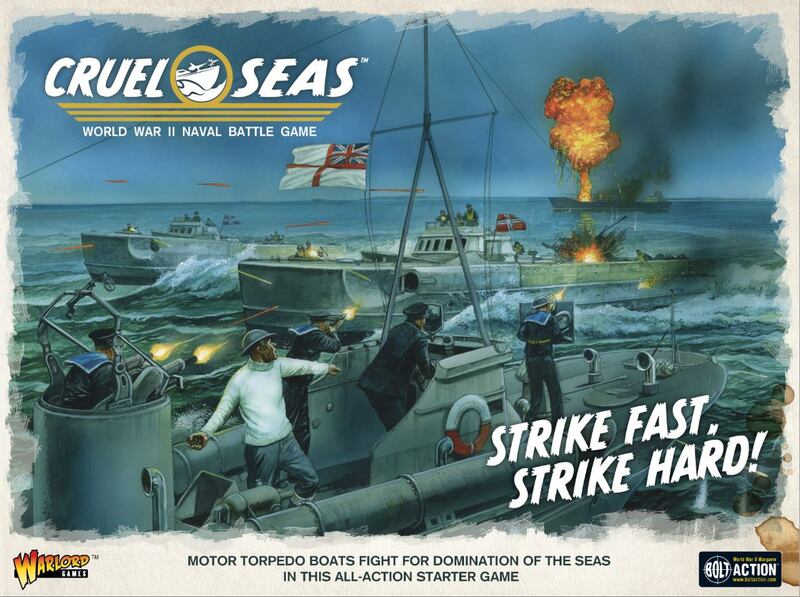 By now I expect that many naval gamers would have seen the forthcoming game of coastal combat in WW2 called Cruel Seas by Warlord and due for release in December this year. Of particular interest is the scale that Warlord have opted to use for the models – 1:300th. This kind of flies in the face of accepted (Accepted? Accepted by whom?) wisdom whereby most gamers of this genre tend to use 1:600th or 1:700th , possibly even 1:1200th. To the best of my knowledge the only source of models in 1:300th scale would be Navwar - as I recall they had a small range of ships available although I stand to be corrected. 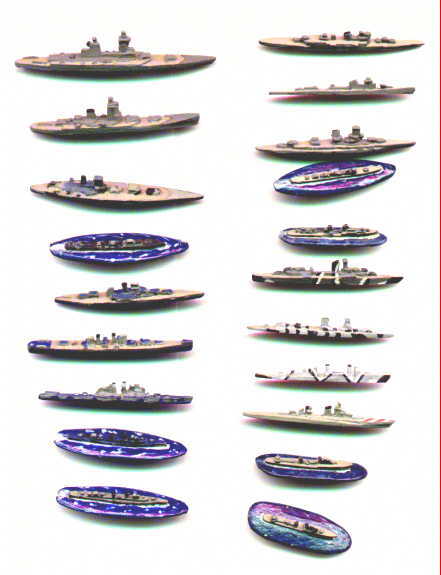 There are of course a number of full hull kits of warships in 1:350th which could be used without too much difficulty. German S Boats - known as E (Enemy) Boats. There are two versions on a sprue and I believe the base game will include two sprues of Germans and three sprues of British for ten models in all. the provisional price is £50 for the starter set. The plastic models that come with the game look very nice indeed - Warlord were giving some test sprues away on a recent games day - and I shall certainly be taking a closer look at this in due course. Coastal naval combat between torpedo boats and similar is something I have long had an interest in but aside from playing an old Micro Game called MTB in the late 1970s I have never really done much about it. I know there are many good sets of rules around for the genre as well as a nice supply of available kit in the aforementioned scales so I have no real excuse for not tackling it other than sheer lethargy. 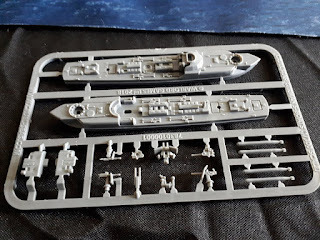 Warlord have promised models for other navies in due course and there will be a goodly variety of types large and small with resin being mentioned as the preferred choice for hulls etc, presumably with metal fixtures and fittings. The choice of 1:300th as a scale would have the advantage that there is an awful lot of material available in terms of terrain, aircraft, land forces etc that could be used alongside the ships. For my part the first thing that sprung to mind with this would be the Mediterranean so I shall incorporate some reading about this facet of naval warfare in readiness for the release of the game in early December. I will also reacquaint myself with the works of Mr David Manley, naval rule writer and all round good guy – if it floats and fights the chances are he has either gamed it or written a rule set for it, probably both! KM Prinz Eugen in action - I suspect there are no prizes for guessing the identity of the large grey mountain following in her wake! It has been a busy weekend but I have managed to make a good start on the ships for the North Atlantic project. For the first time I made use of my ‘portable wargame painting/modelling table’ which was deployed in the lounge by the patio windows. The first order of business was to sort out what was needed and what could be parked for the time being. I had already worked out what else I needed so for the most part it was culling those ships that did not feature in the Bismarck board game. After having done that it was the cleaning up. 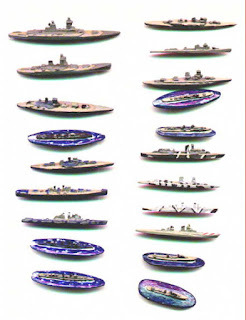 The 1:4800th ships are the old Leicester Micro Models range and as such are a few years old. The detail varies and as I have said previously I am reckon they are on par with first generation Navwar. Having said that the moulds have probably seen better days in some cases as certain ships needed quite a bit of cleaning up. It was nothing that a couple of files, a scalpel and brute force could not put right but it did take some time. My plan originally was to clean them up and then base them prior to painting but I have had a change of heart in this regard because some of the models (HMS Hood I am looking at you!) have a very low freeboard and I can foresee problems painting the sea up to the model - which is what I normally do. I am going to paint the bases before fixing the ships on to them. This will mean rigging up some kind of jig for the ships but I think given the size of the models it is the right call to make. 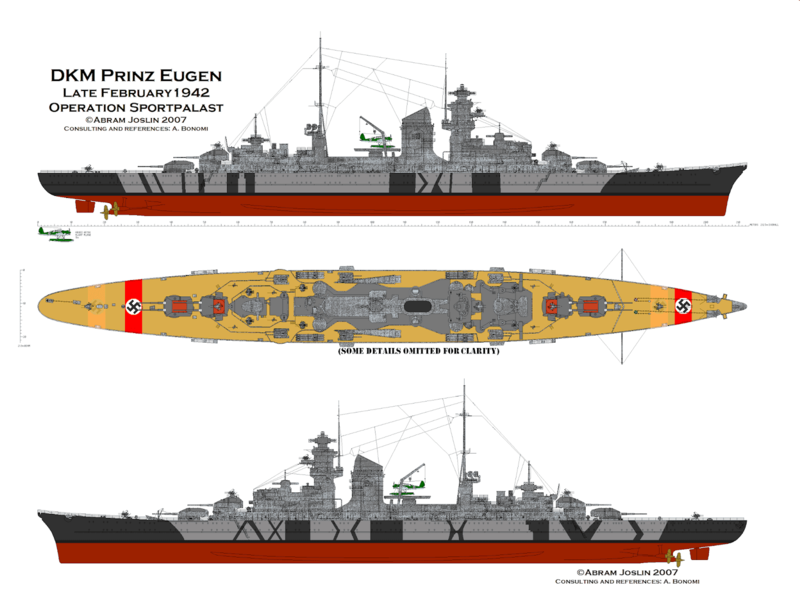 Plan views of Prinz Eugen sporting a 1942 camouflage scheme. At the risk of being boring I shall be using an overall grey paint scheme for the 1:4800th collection. There were a few models that have proven to be beyond saving in terms of rogue castings so these will need replacing. The worst offender here is without a doubt the Prinz Eugen. I ordered three of these and even the one that was OK was fairly crude but the other two came out very badly cast so will need replacing. There was only one mistake in the order but needless to say it was of a fairly crucial ship. I ordered two Scharnhorsts but one of them was of Gneisenau (her sister ship) with her projected refit of six 15” guns. I will keep this but will need to get her in the original configuration. Overall the models are OK and it is only when one looks up close that these issues surface. Once they have been painted they will look fine. I am really excited about the potential of this range and as long as one is prepared for a little work in terms of preparation they are absolutely fine. The one point I will emphasise though is that the service from MY Miniatures is really top drawer and the fact that he is persevering with this range, despite the age related problems, is certainly to be commended. I spent the evening sorting out the models I needed for phase one of the North Atlantic project and those that are currently being reserved for phase 2. The number of ships that I did not need at this stage was quite modest but these have now been safely tucked away for later use. The cast list for the North Atlantic via the Bismarck board game will be cleaned up, based and undercoated by the close of play Sunday so the real work can begin next week. The only issue I have at present is in respect of painting them at the moment is acquiring some lighter shades of grey paint. I prefer using paint colours straight from the tin/pot rather than mixing shades as I never manage to replicate it at a later date! I am going for overall grey with decking painted where applicable. I am not bothering with camouflage schemes as the models are so basic you would not really get the benefit of although if I were using C in C or Shapeways I might be more inclined to have a go. As ever my usual ‘waves, wakes, names and flags’ basing technique will be used so I will need to ensure that I have the correct ship names ready to be printed. I have plenty of ensigns for the bases in any event. 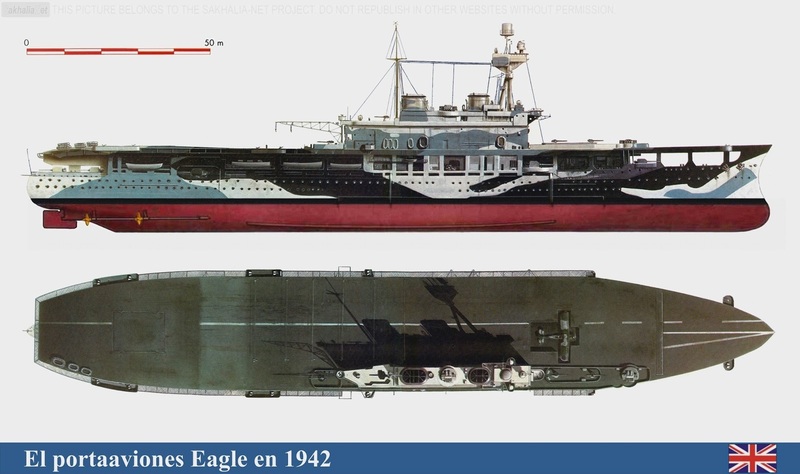 A rather nice rendering of her in her 1942 camouflage scheme. I have everything I need in respect of the Germans but there are a couple of omissions from the Royal Navy. 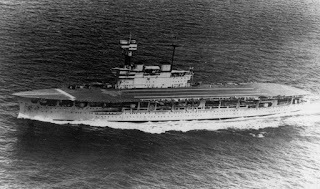 The largest ship is the aircraft carrier HMS Eagle. Although not directly involved in the hunt for the Bismarck she was quite active searching in the South Atlantic for the numerous German supply ships that supported the German operation. As well as the aircraft carrier I am also missing representatives of the following cruiser types – Dido, Arethusa and ‘C’ class. Of these the latter is a minor problem in that MY Miniatures do not make one so I will need to convert something or do without. 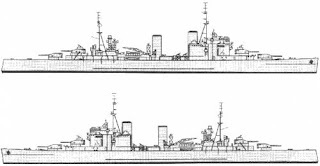 The County class cruiser HMS London is also absent, at least in her refitted Colony Class style configuration. I could use a conventional County Class model as is and to be honest, in 1:4800 it hardly matters. I may see about a conversion but it is not a major priority at present. I need to track down a copy of the Axis and Allies: War at Sea expanded rules and ship data that I had downloaded and printed a couple of years ago. I am sure I still have a printed copy of this somewhere in the man cave and probably a digital version saved somewhere. I also need to extract the intermediate game combat rules from the Bismarck board game and get them typed up. The game contains damage record charts so I will not need to draw any of these up – especially as I have two pads worth of them! With these two sets of rules add the set from Barry Carter I will have the choice of three sets of gridded naval rules to think about. 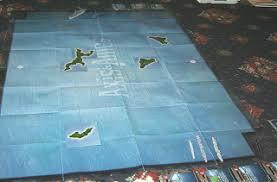 The more I think about it in the short term the more I am thinking that using my laminated Axis and Allies: War at Sea playing mats would be a good idea. They are readily available to use but the laminate is very shiny and unforgiving when used under artificial lighting or camera flash. I am sure I will cope with this somehow. Within the scale I have chosen for my WW2 naval adventures I fully intend tackling the Mediterranean theatre and also the Pacific in due course. In both cases I am looking at no later than 1942 as the latter gets a tad one-sided as the war progresses. 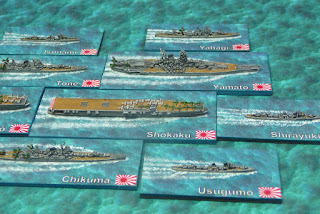 There is also the possibility of the Great War in this scale and this is something I would readily embrace especially as MY Miniatures produce the main bulk of what would be needed for the fleets at Jutland – especially if I go down the ‘replacing the counters with models’ route as I am currently doing so with the Bismarck board game. 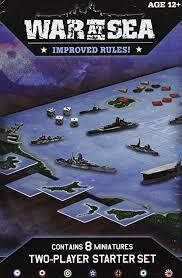 A vinyl Axis and Allies: War at Sea mat available from Gale Force 9. Mine is the original paper version although it has been laminated. Whilst reviewing the contents of my recently acquired copies of Bismarck by Avalon Hill I made a rather pleasant discovery. The game includes counters for all the historical opponents and also the ‘never made it but could have - potentially’ types. The models I have acquired from MY Miniatures in 1:4800 on what was largely a best guess from memory of the composition of both the British and German forces, is largely correct although I am missing a couple of RN cruiser types. To be fair it would not be difficult to remember the composition of the German force for this particular operation! The British cruiser shortfall will be easily rectified once Mr Yarrow is back from his holiday. There are some ships I have ordered that did not feature in the expanded order of battle in the Avalon Hill game but will nevertheless be useful elsewhere. We are not talking about many models at this stage but the plan is to leave off painting them for the time being until I get to the Mediterranean – which will then mean, of course, adding the Italians. In respect of the aerial dimension for this project I fully intend using models in due course but for the time being I have a rather large selection of cardboard counters depicting most of the worlds WW2 naval aircraft. These came courtesy of Victory at Sea – the rules that used to be available from Mongoose Publishing. I have a rather novel idea in mind for ‘basing’ these counters so as to give them the impression of being in flight – more of which in due course. Another part of this project will be getting a 3” square gridded playing surface prepared for use, primarily with Barry Carter’s Naval Wargame Rules in mind although this will also be handy for a few other projects I have in mind. I have a couple of options to experiment with in regards to materials and the all important colour scheme and so am as yet undecided as to how best to tackle this. However, in the short term and in the absence of anything readily prepared I have a laminated set of the Axis and Allies: War at Sea playing mats which, despite having an offset square grid, would be ideal to use the 1:4800th collection with. My immediate priority though, is to get the ships finished so I can then run a North Atlantic style breakout scenario with the Germans having some extra firepower. I will use the Bismarck search boards for the map movement and the appropriate playing surface for the tabletop actions as and when they arise. This will be the main focus of my efforts for the next couple of months and do you know what? I am really excited about this! I know I have used this picture previously but I wanted to share the image again - everything the budding Bismarck captain would need (especially if you use the Graf Zeppelin option!). My second copy of Bismarck by Avalon Hill has arrived and as mentioned previously it is in far better condition than the first version which will be used for spares. I must confess to thinking that it was quite indulgent of me having two copies of the same game but looking at the collections being offloaded in various Facebook groups that I belong to it appears that owning multiple copies seems to be quite common with our friends across the pond. It also appears to me that military boardgames are far more popular in the US than over here. I can offer no explanation for this and stand to be corrected but for sure it seems like there is a far bigger choice available Stateside than in the UK. The plan with this boardgame is to use it to support the 1:4800th scale warships I have for some operational level games set in the North Atlantic during 1941 and as a ‘campaign management system’ it is perfect for my needs. This is a project I have had in mind going back to the early 1980s and so I am pleased to be finally tackling this in the way I wanted to. I successfully ran a mini campaign using Axis and Allies: War at Sea at the club a few years ago which was very well received but to run it as a solo effort has long been an ambition of mine. The Avalon Hill board game has given me the tools to do this. I was very much into board games in the late 1970s and early 1980s – primarily because they meant that I could fight a military game easily and without the need to paint hundreds of figures - and in truth would still be. 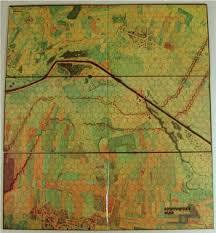 I owned and played many at the time, mostly from Avalon Hill with a smattering of SPI, Battleline, GDW and Yaquinto. 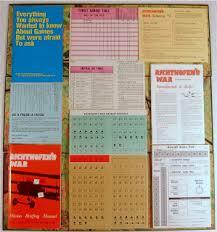 One of my favourite games early on was Richthofen’s War by Avalon Hill. This was a tactical plane to plane combat game set over the Western Front during World War 1 and whilst simpler than many of todays offerings was enormous fun. It was a firm favourite in the cellar of the New Model Army Limited wargames shop where Eric Knowles was the proprietor. It was already popular when I took my copy along for some games one Saturday afternoon in around 1978 or so. I took an Albatross DVa and was quietly circling in the corner of the mapboard gaining height when a Bristol Fighter – mounting a pair of Lewis guns in the rear seat rather than the usual single and flown by an experienced player of the game – bounced me, opened fire with the aforementioned twin Lewis machine guns and left me within a single point of destruction. This was on game turn 2…. I can also recall another World war game – this time Aces High – when I was shot down whilst flying a Sopwith Camel by the rear gunner of a Hannover flown by none other than Eric Knowles. It took a long while to live that down I can tell you as Eric did not as a rule play board games. ....and the all important (and very nice) map board. I really enjoyed the game but several others came along during the early 1980s which consigned it to the back of the cupboard as being more ‘advanced’ and therefore more 'realistic. Amongst these was such titles as Aces High with the Blue Max supplement and Wings – published by Yaquinto and based on the Air Force/Dauntless system devised by the late S. Craig Taylor. Nowadays of course there is Wings of Glory, a card based game – at least for movement and damage resolution - using some quite superb (and expensive) 1:144th scale models of which Mr Fox has a huge selection. For my purposes these days I would look to make use of the very nice range of 1:600th models available from Tumbling Dice for my WW1 fix – there are some very nice rule sets around although for me using models with Richthofens War would be fine. 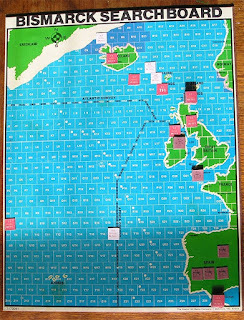 Having said that there are some very nice full coloured counters designed as replacements for the Avalon Hill game available from Upton games – where I obtained my Jutland counters – which would add a little colour to the games. Another option would be to use the models in conjunction with my Heroscape tiles. By virtue of the old Avalon Hill General magazine there is an awful lot of additional material available for Richthofen's War by virtue of extra scenarios and optional rules, all of which will serve to extend the shelf life of the original game. ....as well as the 'auxiliary' aircraft produced in support of specific scenarios. 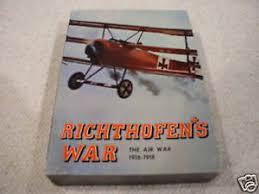 I have mentioned Richthofen's War as quite by chance I have secured a near mint and unpunched copy of the game for a very modest price and so I am looking forward to once again taking to the skies over the Western Front with it. Who knows? I may even go as far as replacing the counters with models but that is for another day methinks. A very useful addition to the scratch building material pile - and at a cost I could not argue with! I have mentioned previously of my intention to follow in the footsteps of both myself and Bob Cordery and to scratch build some ‘cartoon’ style ship models for the American Civil War project. These models will be larger than my previous scratch builds and will also be a lot more generic in nature. In fact I shall not be modelling any specific historical ship, rather my efforts will focus on types instead. This also means that the resultant models will be getting fictional names. They will also be larger than previously as I am using a 5.5” hexed grid in the shape of the Peter Pig gaming mat I own. As yet I have not done anything other than think about the types I shall be modelling and starting to stockpile building material. As monitors will feature in the building program I have given much thought to a good way to make turrets - Bob Cordery has a good method that is demonstrated in his book Gridded Naval Wargames - and had more or less settled on a technique when a chance visit to our local boot sale threw me a welcome curve ball in the shape of the contents of the picture above. At the very last stall of a very mediocre boot sale a lady had a bag of plastic cotton reels. I was looking at them and thinking about the modelling potential when she said I could take them. I was about to ask her how much but before I could she told me I could have them as she was about to throw them away. These will be very useful as aside from the obvious turret sized spools there is also a good selection of much thinner types which are ideal for funnels. Being hard plastic they can be sawn and worked quite easily so in one fell swoop I have added sufficient raw material for around a dozen or so ships. The first (and rather more worn) copy of the Avalon Hill game Bismarck has arrived and so I spent some time yesterday evening sorting through the contents. the counters are primarily unpunched although there are four missing - which I knew about beforehand. The missing counters are two British air assets and a couple of search board Royal Navy ships. I have yet to identify them definitively but at first glance they seem to be very much in the minor character vein as all the main protagonists appear to be in place. The second copy of the game (which is still en route) is in far better condition and is complete with all the counters intact and unpunched. Owning two sets of the game is not what I would usually do but having spares will be useful and certainly the extra measuring devices and damage pad will be very handy. One of the search boards. 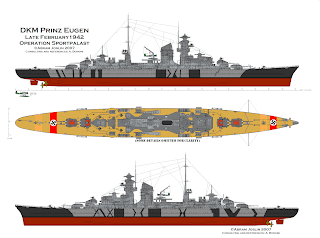 There was an expansion to this that included the South Atlantic and was designed for the Hunting of the Graf Spee. I owned a copy of this game in the early 1980s and had forgotten just how much material is crammed into the box. It is not as packed as that for Flat Top but is still pretty hefty. Aside from the two mounted search boards there is a fold out mounted battle board, copious charts and tables and several range measuring and movement devices. I had also forgotten about how congested - some might say indigestible - the rules are. There is a basic game, an intermediate and advanced version with the latter resolving the battles on a table top in the same way as a conventional miniatures set, rather like Jutland. I must confess that I winced when I looked at the advanced rules which appear rather more complex than I would like but that is how I roll these days as I prefer simpler mechanics for my naval games. In fact the intermediate level game seems to hit the sweet spot but I will need to reacquaint myself more fully with the rules before making any decisions. 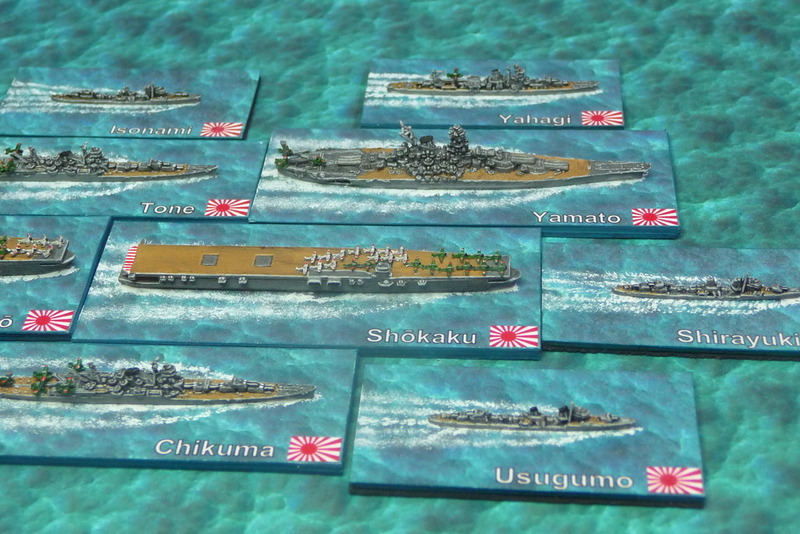 I also took delivery of the remaining 1:4800th ships for use with the above boardgame from MY Miniatures. I now have two fleets for the North Atlantic and beyond and as a result of the extremely fast service from Mr Yarrow, the proprietor, was finally able to order in the bases to start work with them this morning. I also spent some time yesterday looking over the models and seeing how they looked. GHQ they are not but they are recognisable as what they should be which is the main thing. Detail wise I would say they are very much on par with early Navwar style castings. I have been generous with the base sizes for the models so I can revert to my usual font size (12) for the name labels and the customary ensign. All the bases will be 25 mm wide with the lengths being either 70 mm, 60 mm or 50 mm. This is for capital ships, cruisers and destroyers respectively. I will be employing my usual black undercoat and dry brushed shades of grey with blocked in decks where appropriate technique but am conscious of two things. I need to use lighter shades than I have in the past and this also applies to the sea colour. Naturally there will be pictures in due course. 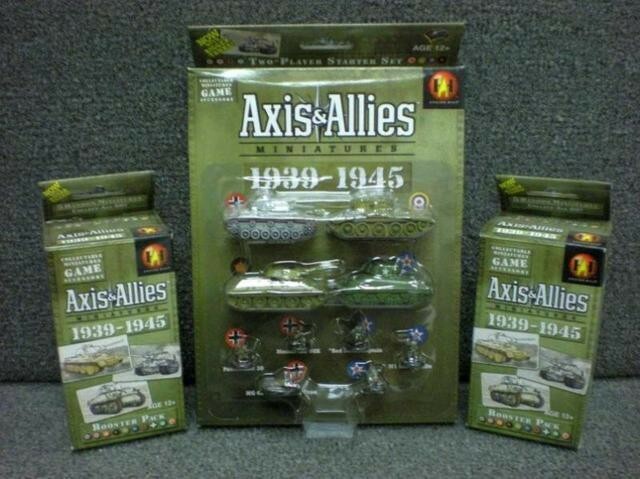 One of the starter sets for Axis and Allies Miniatures with a couple of booster sets. The range expanded to cover the early war period as well as the desert and Eastern front as well as the elements of the Pacific. 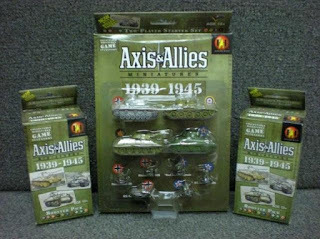 One of the main reasons for me acquiring numerous copies various versions of the Axis and Allies board game is the vast quantity of usable material contained therein. I have already mentioned the ships were to have formed the cornerstone of my current WW2 naval project – sadly no longer but I have a couple of other ideas for them - but there is much else besides. The vehicles are roughly 1:300/1:285th and if you are not over fussy about the level of detail would be perfectly usable for a set up in that scale. Indeed, one of the things I discovered early on is that the Tumbling Dice 1:600th scale infantry measure roughly 5mm tall and look quite comfortable alongside the plastic vehicles. I have plans for these at some point. 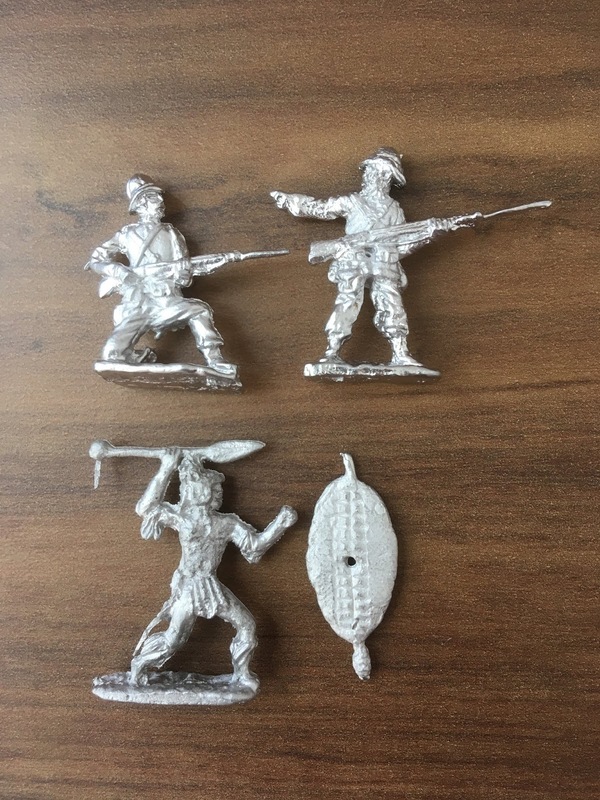 There is also a lot of infantry scaled at roughly 20mm – I say roughly as they on the small side – and these are very much generic examples from each nationality. My only gripe is that the British infantry figure is wearing 8th army shorts. The German infantry figure is wearing what I would call the generic Hollywood early war uniform with jackboots. I fully intend painting these up in traditional field grey for Europe and also for the Afrika Korps. There are certainly enough figures to do this! I placed a couple of the figures alongside the recently acquired North African Village set which is scaled at 15mm and they are perfectly at ease alongside them. This is very handy as it ticks a large box in my project list. There are some other pieces available from Flames of War for the desert which, whilst a little on the pricey side (as pre-painted kit tends to be in my experience), has the advantage of being ready to use straight from the box. Ordinarily I would shy away from this type of product but given that he village set cost me next to nothing I can afford to invest in a few pricier pieces. 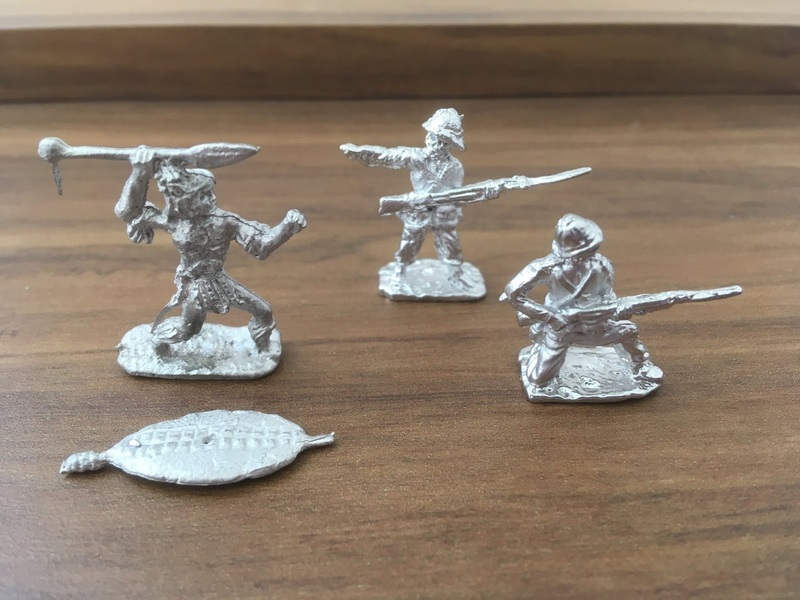 The 20 mm plastic infantry figures that come with the Axis and Allies strategic board game. From the top left there are Russian, British and American figures with the Germans and Japanese featuring on the bottom row. I have a lot of the Axis and Allies infantry all of which are in variations of an advancing pose with the weapon held at varying angles depending on the nationality. The quantity I own for each of the main combatant nations is more than sufficient for my needs which is just as well as I will not be investing in any other figures for the project. I am going to use the technique employed by Memoir ’44 whereby infantry support weapons (and I am thinking of the expansion sets rather than the base game) are represented by a generic model placed with the unit to signify its presence. Being mindful of aesthetic sensibilities as I am, ahem, I will place a model MG, mortar or Infantry anti-tank weapon with the unit when needed. Should I need to deploy them in their own right as a separate unit then I would merely assign a couple of infantry figures to the model as a crew. Similarly I will also assign a couple of infantry figures as crew to artillery or anti-tank guns. All this will be in 20 mm BUT, I shall be taking a leaf out of the Zvezda Art of War Operation Barbarossa game and using 15 mm for vehicles. My decision to use 15 mm was influenced primarily by the table footprint of 20 mm models. As the games I shall be playing will vary in terms of the scale of the action being represented (rather like memoir ’44) it makes sense to have models that occupy as small an area as possible. As I am using a 3” square as my grid size of choice having smaller vehicle models looks better for my particular set up. I will also be able to make use of the Axis and Allies Miniatures game map sheets I have - you may recall the laminated versions that featured in a previous post - which are hexagonal. When the game was available the figures and vehicles were also 15 mm. The somewhat relaxed approach to this particular project is solely because I am essentially up-scaling Memoir ’44 so producing a vast array of historically appropriate equipment and models is not really necessary for a good game. Not for everyone I know but it works for me and how I want to game the period. One of the great things about our hobby is the opportunity to try new things out on the table top. In fact it is safe to say that a very high percentage of our games are hypothetical scenarios - these are the grist to the wargamer's mill. Occasionally history provides us with sufficient tools to be able to extrapolate a given event beyond that which actually took place. The North Atlantic in 1941 is a very good example of this. ....and as realised by Revell as a 1:720 plastic kit. 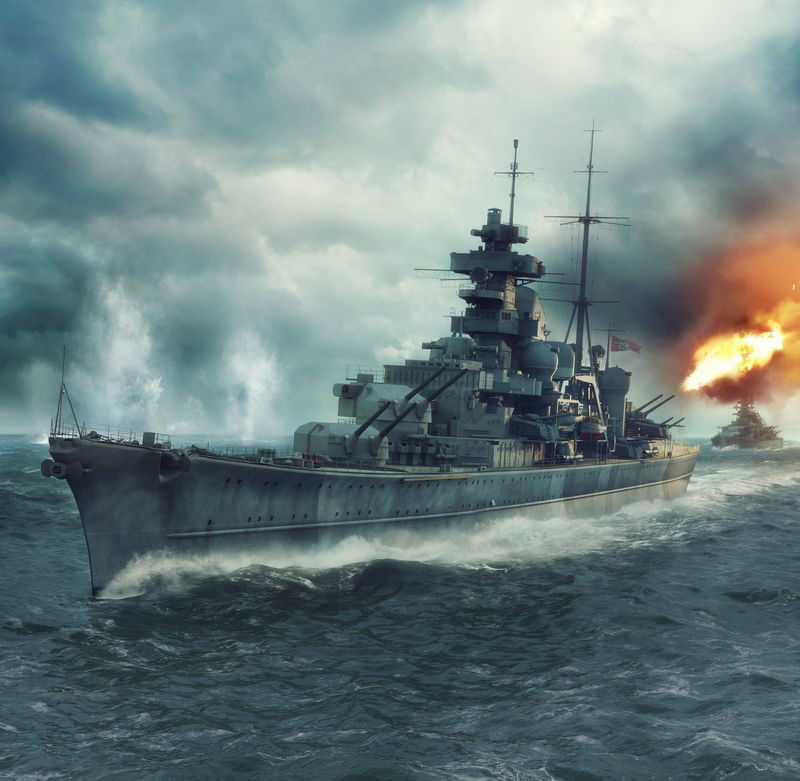 Operation Rheinubung, the German sortie into the Atlantic intended to ravage the convoy routes, could have put to sea as a far larger force were it not for the repair and maintenance being carried out on the battle cruisers Scharnhorst and Gneisenau. The Bismarck's sister ship, Tirpitz was not quite ready for operations (although her captain offered to take her in support) and the only remaining light cruisers the Kriegsmarine still possessed did not have the required range of action. 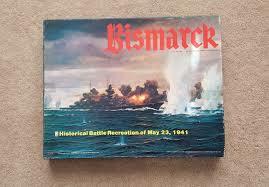 So it was left to Bismarck and the Prinz Eugen to face the Royal Navy with the well known end result. There is a big 'what if?' in that supposing the other German units were ready for use the force that could have sailed would have given the Royal Navy a real challenge especially if - and this is taking the whole 'what if?' to another level - the German task force had the support of an aircraft carrier. 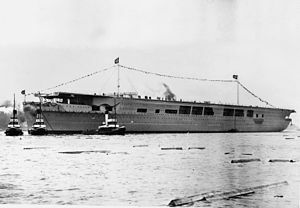 The Graf Zeppelin never made it into service but it is fascinating to speculate what impact she would have had had she done so. Originally intended to carry a selection of navalised JU 87 dive bombers and Me 109 fighters as well as Fi 167 biplane torpedo bombers the Graf Zeppelin would have possessed a limited strike capacity more in keeping to the Royal Navy practise rather than the US or Japanese. Of the Stuka little need be said but the Fi 167 was a very interesting idea although it was never produced in great numbers especially when work on the Graf Zeppelin was suspended. Rather like the more famous Fi 156 Storch the Fi 167 had fantastic low speed handling characteristics making it ideal for carrier operations. In 1944 one of these whilst serving in the Croatian Air Force had the distinction of shooting down US P51 Mustang although it was shot down in the process. 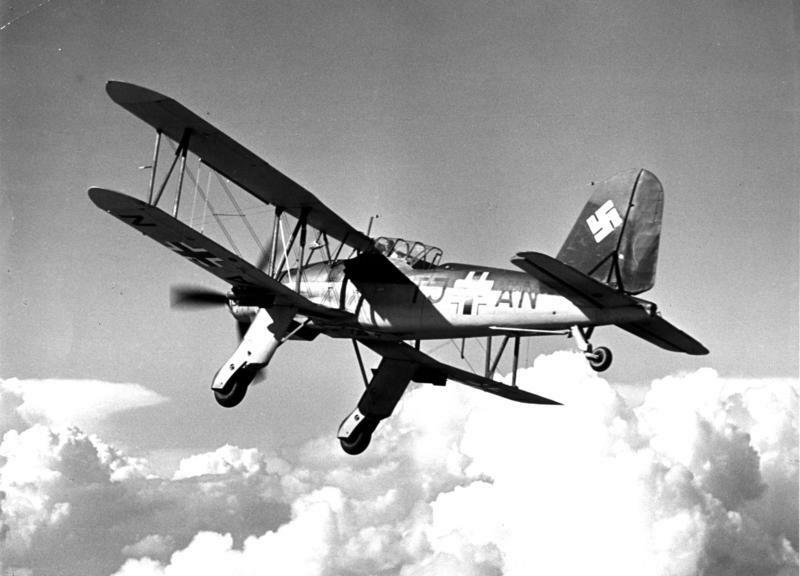 The naval version of the Me 109 (actually the Bf series) designated 'T' carried out flight training on a short runway airfield in Norway that was known for high cross winds, similar to what one would expect on an aircraft carrier at sea. Sadly when work resumed later in the war on the Graf Zeppelin the Bf 109 T (based on the E series) was outdated by newer types. 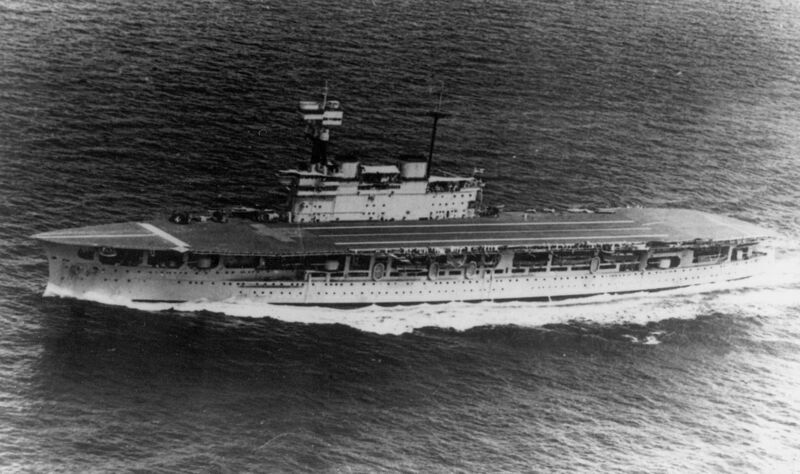 In 1941 had they been deployed in their intended role would have been more than adequate for a Combat Air Patrol although the perennial problems of take off and landing problems associated with the type due to its very narrow wheel track would have only been worsened on a heaving flight deck! A further consideration for both the historical and a hypothetical operation is the supply efforts the German put in place to keep the task force at sea. There were 9 support ships tasked with refuelling and re-provisioning the German raiders all of which were easy meat when found - the Royal Navy accounted for 7 out of the 9 deployed - but again, finding them used up a lot of ships covering a wide area, ships that could have used elsewhere. I have not even begun to consider the US option yet - one for another day methinks. Now that is what you call service! I placed my order for the 1:4800th scale ships with MY Miniatures last Thursday evening and they arrived this morning. I am very pleased with this - not only for the turnaround and cost - as it maintains the momentum of the project. It has also presented me with a rather delicious dilemma, one that called for a further change to my WW2 North Atlantic 1941 project. My plan originally was to use the vessels from Axis and Allies and to supplement them, originally with 1:3000th models as the ship sizes are all over the place, ranging from 1:2400th for the destroyers to 1:4250ish for the capital ships. I tried using 1:3000th alongside the capital ships but they still look wrong hence my decision to look at 1:4800th and I am very pleased I did. They are ideal for what I want to do and have the huge advantage of not only being very reasonably priced but are also quite recognisable as the types they are representing. Detail-wise they are quite basic and so should be treated as, in effect, 3 D gaming pieces. Painting will be a breeze although I suspect I will need to order in some bases. Of the Axis and Allies ships the only types that are close to an accepted scale are the destroyers which come in at 1:2400th. However, the vast array of merchantmen will certainly be usable in the 1:4800th world I find myself in. There are more detailed models available in this scale with a corresponding increases in cost. C in C and Shapeways feature 1:4800th models but not only are they very detailed but they are not cheap. The relatively basic models from MY Miniatures will suffice for me and I am looking forward to getting them under the brush and on the table. With the imminent arrival of the remaining ships for my North Atlantic project (at least for the first phase) I have endeavoured to get myself 'back in the zone' by attacking the naval section of my library and also revisiting Barry Carter's excellent book on naval wargames. 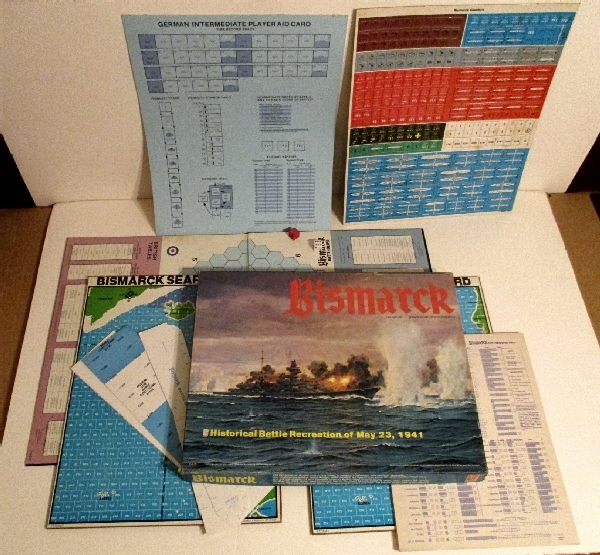 One thing I have been keeping a weather eye open for to support this project is a copy of the excellent Avalon Hill game: Bismarck. A classic board game with an excellent search system. The game has a basic, an intermediate and advanced version with the latter using counters on a tabletop rather than than a board - rather like Jutland but with a lot more detail. The principle reason I was keen to gate a hold of a copy of this is for the search system and its associate components. There are two search boards - one British and one German with unique data for each side contained therein. Note the use of offset squares rather than hexes. On the map boards are used in conjunction with individual ship counters or air assets. 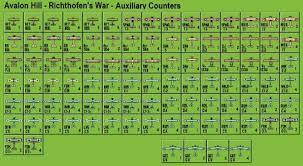 Counters also exist for task forces. Essentially one needs to be in the same grid square to initiate combat which is then resolved on the tabletop (or on the battle board is using the basic game). I have at last managed to track down a copy of this game that will not require me selling body parts to finance. I have also tracked down a rather better copy so will own a couple of sets.